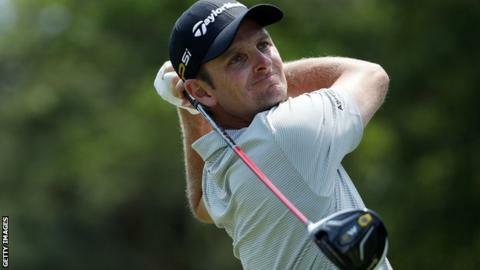 England's Justin Rose hit a three-under-par 69 to trail leader Rickie Fowler by two strokes after the third round of the Wells Fargo Championship. Rose fired five birdies and two bogeys at Quail Hollow Golf Club to sit at seven-under and tied for third. World number five Fowler (68) recorded six birdies in nine holes as he chases his first victory since Abu Dhabi in January. Defending champion Rory McIlroy had a one-over 73 to lie eight behind Fowler. England's Paul Casey is still in contention at three-under after a level-par round in Charlotte, North Carolina. Rose told Sky Sports: "It was what the doctor ordered and has got me right where I want to be going into tomorrow. Being a couple back on the leader is nothing on this golf course." American Roberto Castro is in second after dropping a shot on the last hole while sharing the lead with Fowler.